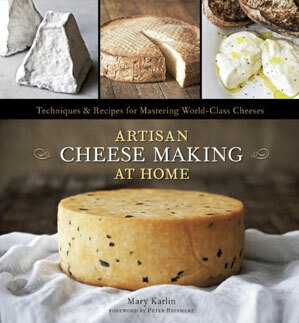 Mary’s latest book and theme of her sell-out DIY cheese making classes, Artisan Cheese Making at Home, is the quintessential guide of how-to recipes and techniques for mastering world-class cheeses in your home kitchen. As a hobbyist cheese maker know that you will be faced with challenges that professional cheese makers don’t due to your skill level plus inconsistencies and variables that will likely come with home kitchen-based cheese making. Expect that you won’t have all the answers yourself. Let my book and this website be your guide. As an educator, I expect to field many questions and supply answers to hobbyist cheese makers. If I don’t have the answer, I’ll ask an authority in that arena to chime in. Please email me at mary4cheese@gmail.com with any cheese related questions. I will answer each email and where the question is helpful to a broader group of viewers, I’ll post the question and answer here. Feel free to send comments as well as questions. When should I salt the curds? Follow what the recipe calls for. If your recipe does not state a specific point at which salt should be added to the curds, the general timeline would be to add in the draining phase, when the curds have released most of their whey but are still moist and warm. The warmth of the curds will dissolve the salt efficiently and will absorb salt. Gently toss in the designated amount of kosher or sea salt in 2-3 increments to evenly distribute. From there, follow the remaining salting procedure (if any) as designated for that style of cheese; i.e. dry-salting or brining. With some styles of cheese, the curds are not salted in the draining process; salt is added in dry salting or brining. This will be clearly stated in the recipe. I’ve followed the recipe but my curds don’t always form as soon as the timeline given in the recipe. Why is that? As with any cooking (cheese making is cooking), there are variables involved. The milk being used will affect curd development. Raw, pasteurized, or pasteurized and homogenized milks will require different timelines or amounts of acid or culture to form desired curds. Though labeled pasteurized, not all pasteurized milks will react and coagulate in the same manner. Some milks may have been pasteurized at the high end of the allowed temperature range, making curd formation more challenging or sometimes impossible. Try to stay consistent with the brand of milk you use once you get the results you are looking for. As in any recipe, the timeline stated is a guideline; the lower end of the timeline for when curds should form is a check point. More time may be required for proper formation. In direct-acidified fresh cheeses, you may need to add a bit more acid, or maybe raise the heat slightly to cause coagulation. Or, with a cultured cheese, to have properly set up curds and get a clean cut/break in the curds, you may just have to wait a few more minutes of development for a clean cut to occur. My general message is this: the pot will tell you when the curds are ready. Make adjustments as needed. Every once in a while errors in a recipe slip through the editing filters before a book or article goes to print. Sometimes it is an inaccurate measurement or cooking time. Other times, an ingredient may be wrongly identified. Mistakes happen. This section is dedicated to presenting any needed corrections to you as they are identified. If you find anything within the recipes presented that just doesn’t work for you, please advise me of those issues. Email me at mary4cheese@gmail.com. Together we can remedy any inaccuracies. As corrections are identified, they will be forwarded to the editor at the publisher for future printings.